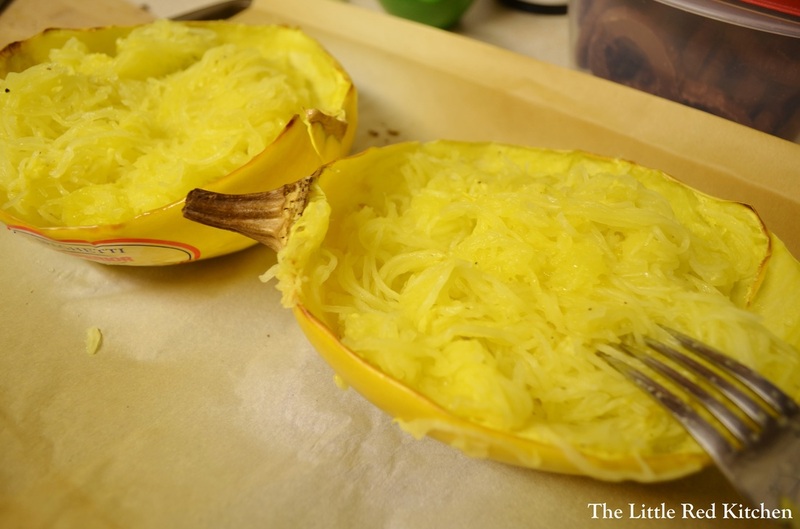 Spaghetti squash, like eggs, is one of those foods that gets me so pumped about what food is. It’s a squash like any other squash, but then you run your fork through it after baking and BAM! Perfectly formed spaghetti strands. 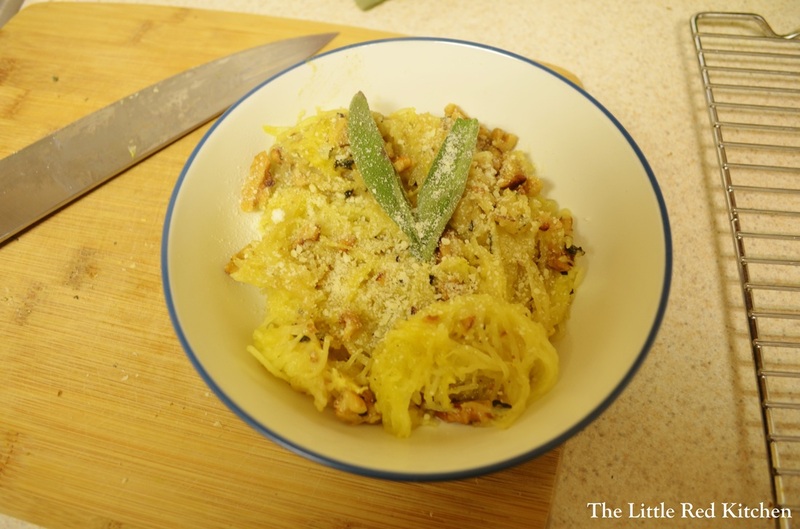 Food can be amazing, and spaghetti squash needs no embellishment, which is why I paired mine with a simple and quick sage and walnut butter sauce. This is a classic sauce…you don’t always have to reinvent the wheel in the kitchen. But it pairs so perfectly with the delicate squash, and it’s so yummy to boot. Vegetarian or not, this is a fantastic Fall supper. Preheat your oven to 400 degrees with the oven rack in the middle of the oven. 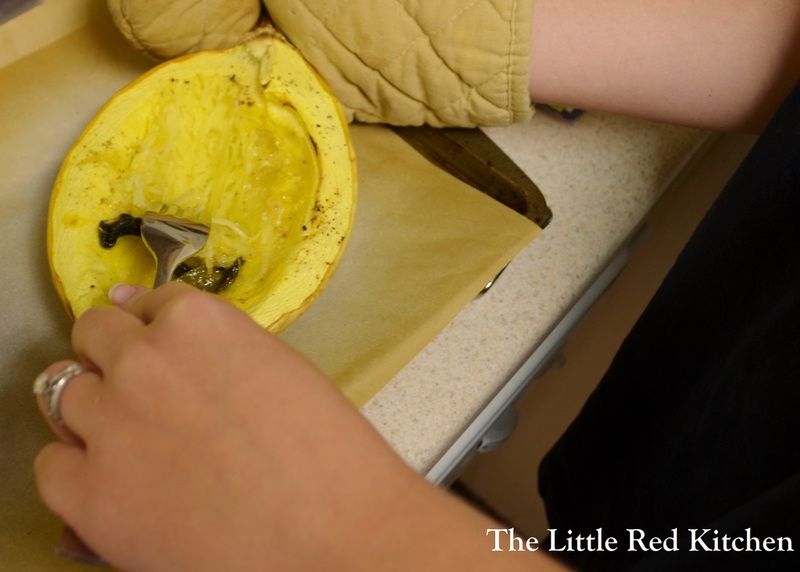 Using a sharp knife, carefully halve your squash lengthwise and scoop out the seeds from each half. Place each half on a rimmed baking sheet, flesh side up. I put parchment down first, like always, so that in case the squash leaks or bubbles, I don’t have to clean up a sticky baking sheet, I just have to throw away the parchment. Season each half with a 1/4 tsp. of the salt and pepper, then place 1 tbsp. 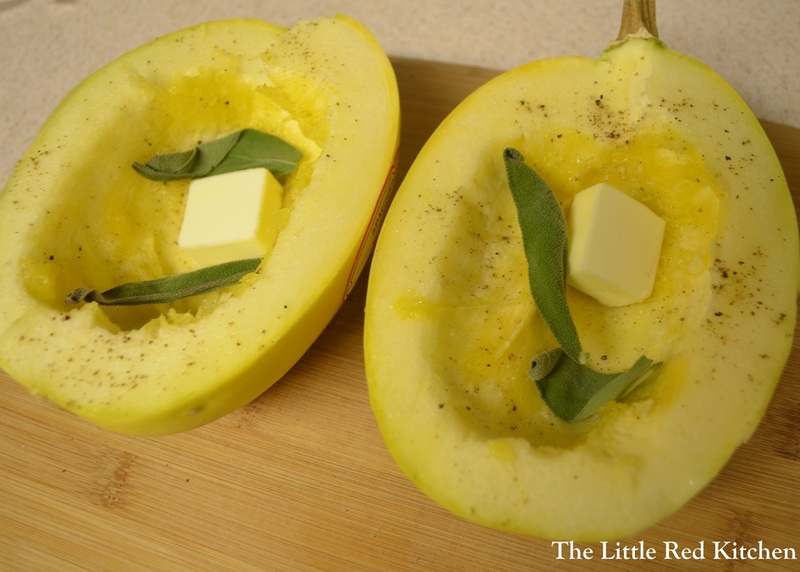 of the butter and 2 sage leaves in the hollows of each squash half. Bake the squash on the middle rack until the flesh is just soft, about 40-45 minutes. For a larger squash, this may be closer to an hour. 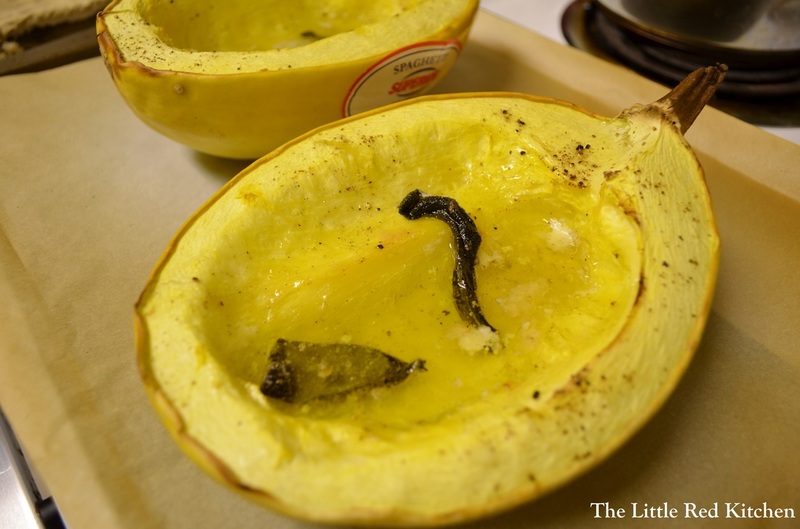 Remove the squash from the oven and let cool until you can work comfortably with it, about 15 minutes. Here comes the fun part. Using a fork, simply run the prongs long-ways across the flesh, and it will form spaghetti strands. Just try to keep that lovely pool of butter in there, tossing it with the squash as you go. 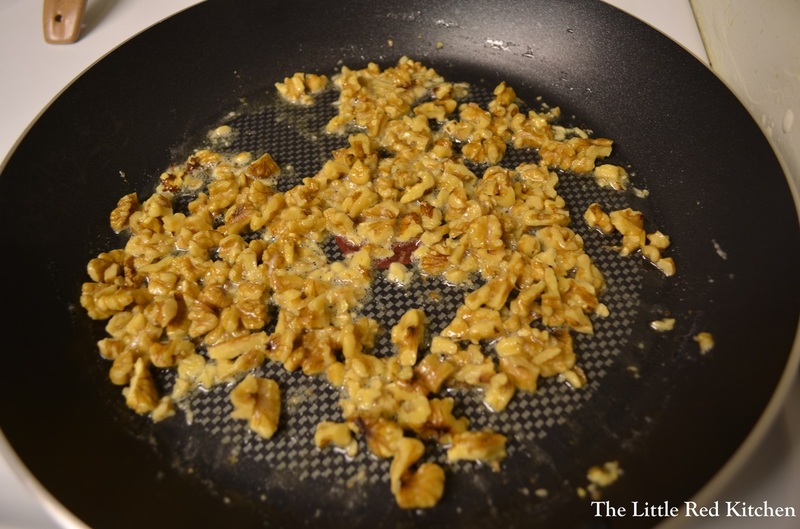 Heat the remaining butter in a large skillet over medium heat, then add the walnuts and toast for about a minute, letting the butter foam and sizzle. 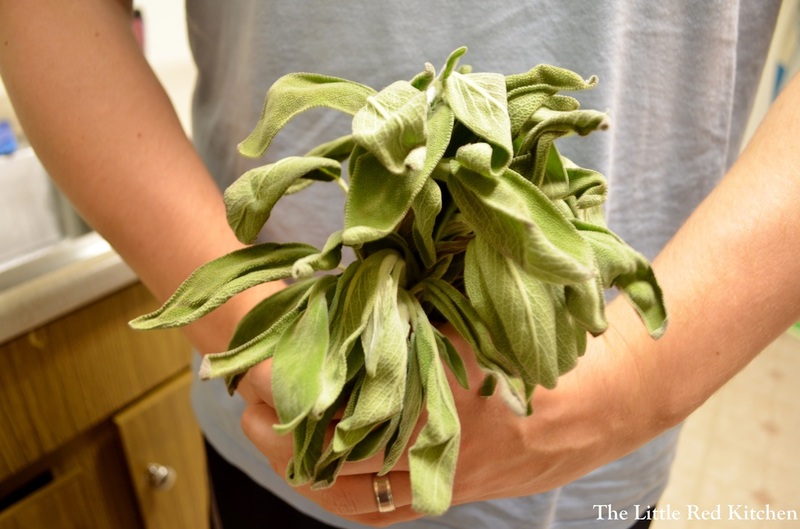 Then add the remaining sage leaves and stir them around for about a minute as well, until they start to crackle in the pan. Done! Add the spaghetti to the pan, toss to combine and warm through for about a minute or two. Add the rest of the salt and pepper if you need to and serve, topping with the grated cheese.